Today is Martin Luther King Jr's day. I was originally going to include his speech (or at least an excerpt of it as it is over 16 minutes long), instead, I'm just going to direct you to www.americanrhetoric.com where you can download the "I Have a Dream" speech in its entirety. Unfortunately the sound quality is pretty low and I think it's in mono. I don't know if you remember, but this famous speech was the subject of many years of legal battle between the Estate of Martin Luther King Jr and CBS. The Estate argues that the work is copyrighted and CBS should pay them a license fee per usage and CBS argues that it's public performance and should be in the public domain. The case closed as both side settled out of court, but personally I think it should be free to use by any media to remind us about civil rights and racial injustice. Anyway, to tie today's holiday to music, we're going to talk about "Happy Birthday" by Stevie Wonder. This song was written and released in 1980 and appears on his album Hotter than July under the Motown label. The song was used to campaign for a national holiday, and six years later, the United States established the observation on the 3rd Monday of January (King's birthday is January 15). Bonus: Download a Crowd Control remix of "Happy Birthday" on their myspace.com. The Dynamics are a soul and Motown band from Detroit, Michigan, from the late 60s to 70s. 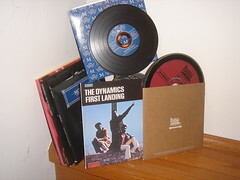 38 years after the original release of First Landing (1969), the album is re-issued on Hacktone Records. They must've remastered the audio or something, because the sound is amazing, especially if you listen with good headphones. The CD actually looks like a record mock-up, which I'll include a photograph of other CD that looks like records here. If you know anything about Detroit, you probably know that it was the home of Motown Records ("Motor City" Detroit). The Dynamics formed under this heavy influence of Motown, but what makes this band stand out from the other Motown acts was that they had three lead singers and were managed by Ted White (who was married Aretha Franklin to at the time). He flew the band down to Memphis, Tennessee, to record their first album First Landing. The rhythm section by the American Recordings crew, the same people that was responsible for Aretha Franklin, Wilson Pickett, and Elvis Presley (with his comeback hits "Suspicious Minds" and "In the Ghetto"). Anyway, most of the music back then was also very regionized, due to poor communications between all the radio stations. So, unfortunately, the only big hit for the Dynamics was "Ice Cream Song". There's a few really good songs off First Landing, but I'm going to have to go with "Ain't No Sun". The reason is because this is the Dynamics' first recorded record that they put out. It's also important to note that this song was originally by the Temptations, but from what I've read the Dynamics' version has a very different sound. I don't have the Temptations song, but you can hear a snippet here. The album Keep Reaching up by Nicole Willis and The Soul Investigators is the latest to come out of the European Nu Funk movement. Released by Timmion Records of Finland, this particular record is quite funky and reminiscent of 60's and 70's USA Motown grooves, however with a sleek modernity. on flute, tenor, sax, horn, and string arrangements. The Soul Investigators is mainly comprised of ten members Jukka Sarapää on drums, Didier Selin on tamborine, guitar & bass, Pete Toikkanen on guitar & bass, Antti Määtänen organ, piano, Sami Kantelinen bass, Lasse Tolvanen tenor sax, Erno Haukkala trombone, Eero Savela trumpet, Antti "Kana" Lauranen on baritone sax & flute and Karri Siren as live MC & tamborine. Alongside Jimi Tenor, strings arrangements were contributed by Pekka Kuusisto. The perfect pairing of Nicole Willis, a vocalist hailing from Brooklyn, NY, and the Soul Investigators, a Nu Funk band, is very melodic, easy on the ear, and, well, groovy. On their myspace page, Nicole Willis states "The sound of this group reminds me of dancing to the new James Brown 7" in the record shop on Clarkson Avenue with my sister when we were 6 & 8 years old." Similarly, it reminds me of my parents old records. It conjures up some of those old classic curatorial funk and Motown archetypes, yet its got that lounge feel thats new and sophisticated enough to listen to while drinking a martini. album.You be the judge of which you like best. Another superb track, their lead single This Ain't Love (Don't Know What Is), nominated on BBC Worldwide's "Track Of The Year" list, adopts a thoroughly vintage Motown sound. If you have always wished for a continuation of the golden oldie songs of the 60's, this is your ultimate tune. It's quite a sad song about love gone wrong. From Wills' lovely alto to the ethereal ending of the flute, the song is tightly arranged and has a lovely immediacy for the listener. Nicole Willis and the Soul Investigators together have succeeded in resurrecting that old funk and Motown sound many of us secretly love to groove to, yet despite its exact replications, which are a sign of our times perhaps, they make it totally fresh and very now. As the trends would have it, a turn back to these old time grooves is what we have been seeing with a lot of the new generation of pop singers, like for instance the UK's Amy Winehouse and Lily Allen. Is it any wonder that Nicole Willis and The Soul Investigators have been enjoying popularity on the UK scene as well? Those who dig the Verve Records remixes of classic jazz songs will also love these new tunes. Nicole Willis and the Soul Investigators is not to be missed by anyone who is lovin' this modern take on jazz.